San Diego, CA—The Sony World Photography Awards issued a call for entries. Created by the World Photography Organization (WPO), 2017 marks the awards’ 10th anniversary. Photographers are welcome to enter their work for free into any of the awards’ four competitions. The categories are: Professional, Open, Youth and Student Focus via worldphoto.org. The newly relaunched website is designed to give a greater visual platform to the awards’ photographers and make the entry process simpler than ever before. In addition to the four main competitions, the World Photography Organization is also searching for the best local photographer in 60 countries. These photographers will be honored through the National Award program. The 2017 edition of the Sony World Photography Awards also sees new categories introduced across all competitions. The WPO’s hope is to challenge photographers to push their creative boundaries. The Sony World Photography Awards offer a range of benefits for its winning photographers. These include the latest Sony digital imaging equipment. Additionally, $25,000 will go to the winner of the Photographer of the Year title and $5,000 to the winner of the Open competition. Additionally, Sony digital imaging equipment will be given to the National Awards winners. 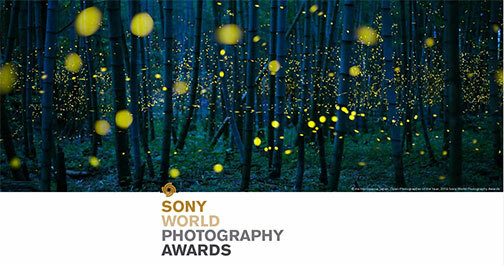 Winners of the awards will also be part of the Sony World Photography Awards Exhibition in London. In addition, they will be included in the annual Sony World Photography Awards winners book. All winning photographers will be flown to London to receive their prizes at the annual awards ceremony. The World Photography Organization is a global platform for photography initiatives. Working across 60+ countries, its aim is to raise the level of conversation around photography by celebrating the best imagery/photographers.